Network virtualisation stimulates innovation in telecommunications by enabling diverse network architectures to cohabitate on a shared physical infrastructure. To make this possible, network elements need to be ‘programmable’ – software-defined networking (SDN) makes the control plane programmable, while network function virtualization (NFV) does the same for the data plane. By doing so, network architecture complexity becomes lower (e.g. easier network configuration via a centralized SDN controller), network-related expenditures are reduced (e.g. NFV promotes the usage of programmable general-purpose hardware), and it becomes less demanding to innovate (e.g. network operators become less dependent on standards development organisations and vendors to introduce new features). The Dutch Ministry of Economic Affairs has requested Dialogic together with iMinds and Radicand Economics to execute a short, exploratory study, to contribute to an orientation on impact and effect of virtualisation of telecommunications networks. 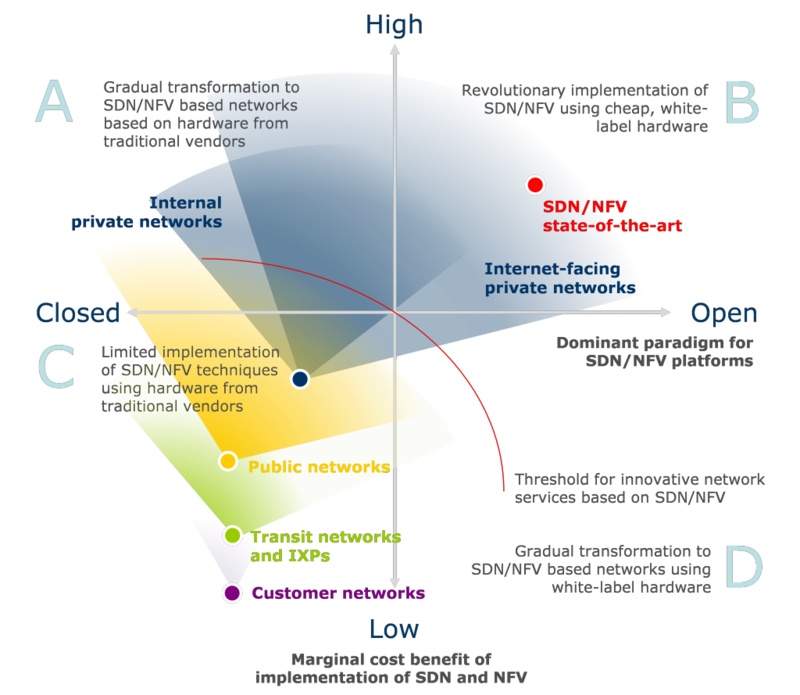 The implementation of SDN and NFV is driven by two forces in the market, visually depicted in the figure above. 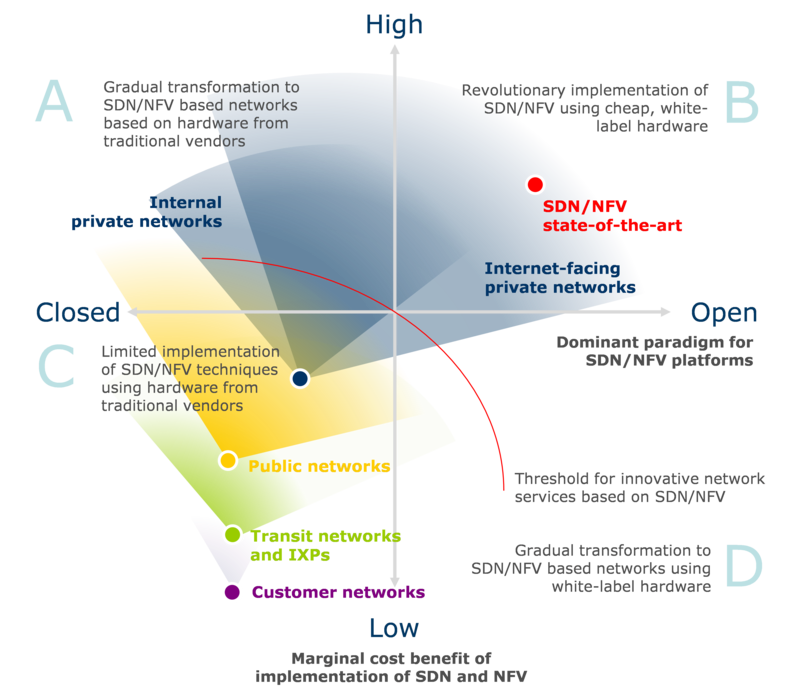 The first is the dominant paradigm for SDN and NFV, which is an attribute of the supply side. The second is the adoption rate for SDN and NFV technologies, which is an attribute of the demand side. Network operators are under pressure to come up with more innovative solutions, at least to control CAPEX and OPEX, and also to introduce new functionality and services to end-users, by using network resources in more flexible and efficient ways. In the longer term, without excluding the possibility that the market may remain stuck in scenario A, the market will therefore migrate to another scenario in the coming, say five, years. The degree and way in which this happens, is depicted in scenarios B, C and D, relative to baseline scenario A. Analysis of efficiency drivers in relation to the different scenarios showed that network virtualisation is beneficial for static and dynamic efficiency, and will strengthen the positive externalities of ICT for the economy and society as a whole. Nevertheless, the impact on specific public interests, for instance related to cybersecurity, are uncertain, as new risks may come to the surface, while at the same time, networks and applications may become more resilient to threats. By construction, scenario D (open paradigm, high adoption) sketches the most attractive perspective for welfare, both in the short and in the long run. The scenario analysis, however, is not able to establish the likelihood that a given scenario materializes. Similarly, the analysis is not suited to identify policy proposals that make scenario D more likely to come about. From a technical perspective, the functionality offered by NFV/SDN is already possible by using currently existing technologies. While we do not foresee revolutionary business models based on the technical merits of SDN and NFV, we do expect evolutionary introduction and modification of business models based on the incremental improvements in organisational efficiency provided by SDN and NFV. Direct (physical or logical) access to networking equipment will stay relevant for the years to come, due to the fact that not all functionality is available when an abstraction layer is used. Also, for debugging purposes, direct access remains relevant. For now, it is important to first of all monitor market and technological developments. Physical access to networking equipment as well as access to lower layers (layer 2 specifically) appear to remain relevant for the next coming years as SDN and NFV mature. While this may not require access regulation to be changed just yet, we advise to investigate whether policy can be changed such that(in the future) access to (certain parts of) a network orchestration layer may be regulated. Without further clarification with regard to regulation of virtual networks, network operators will need to turn to the market authority in order to decide which services are provisioned ‘outside the internet’ and which remain on the over-the-top connection. If the decision remains at the discretion of the network operators, it might, at least in theory, lead to additional barriers to entry for service providers. To guarantee the aim of net neutrality whilst at the same time having market parties and society reap the benefits of SDN and NFV, a (continued) dialogue between regulators and market parties is advisable. The implementation of SDN and NFV and centralisation of control may grow the attack surface of network infrastructure. Centralisation of control may also provide a way to easily audit the security and traffic policies in a network for compliance with rules and regulations (e.g. on privacy, net neutrality. The abstractions provided by SDN and NFV in theory make it possible to swap hardware from one vendor with hardware from another. At this point we do not see reason to adapt policy specifically to address security or privacy concerns following from the adoption of network virtualisation technologies. Can you use big data to measure music experience in a smart city?